Assam CM Sarbananda Sonowal in a meeting with the representatives of Matak community at the conference room of Assam Legislative Assembly on Wednesday. Assam government will build a state level museum in the honour of first ruler of Matak Kingdom, Sarbananda Singha at Chabua in Assam’s Dibrugarh district, which will showcase the cultural, social, historical and spiritual heritage associated with the Matak community. 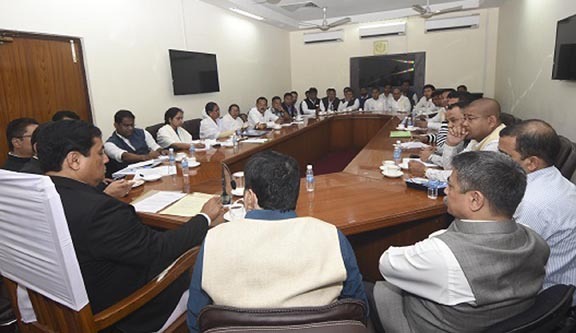 This was disclosed by Assam chief minister Sarbananda Sonowal while chairing a meeting with five organizations belonging to Matak community at the conference room of the chief minister at Assam Legislative Assembly here on Wednesday. The meeting was organized to discuss several problems faced by the people belonging to Matak community. In the meeting, the group of five organizations representing the people belonging to Matak community submitted a memorandum consisting of various demands and requested chief minister’s intervention for the fulfillment of their demands. Chief Minister Sonowal assured that his government would fulfill all the demands in phases. Responding to one of the demands of the Matak organisations for a permanent bhawan (building) for the Matak community in Guwahati, chief minister Sonowal asked the deputy commissioner of Kamrup (Metro) Biswajit Pegu to allot a land in the city. He also said he would provide Rs. 1 crore for the construction of the bhawan in the city. The meeting also decided to prepare a roadmap for the preservation of heritage sites of the Matak community scattered in different parts of the state. Sonowal also informed the meeting that granting of ST status to Matak community is in advanced stage of its implementation and maintained that the government would accord ST status to Matak community without compromising the rights and privileges of other existing ST communities. Considering the role played by the leaders of the Matak community like Sarbananda Singha, Matibar Senapati and Bhagirath Gohain and in recognition to the immense contribution of these leaders, state government would help installing life sized statues of these leaders in different places of the state. Chief minister Sonowal also said in acknowledgement to the role played by Rupahi Gabharu, the state government would set up a Woman Skill Development Centre after her name to empower the women belonging to Matak community. Moreover, considering the immense potentials of the students belonging to Matak community State government would ensure imparting free coaching to the aspirants preparing for APSC and UPSC. Chief minister Sonowal also asked the representatives to prepare a map encompassing Matak people-inhabited areas in the state. Replying to a request made by the members of the delegation regarding putting an end to declassification of agricultural land in Matak people inhabited areas, chief minister Sonowal assured that needful will be done in this regard. He also informed the delegation that the proposed sports university after the name of Gurojona Anniruddha Dev is in the advanced stage of its implementation and the State government is doing everything possible to make the sports university a seat of excellence in the country. The CM also assured that the government would periodically review the stages of implementation of all the 28 demands made by the organization of five Matak bodies. Minister for Welfare of Plain Tribe and Backward Classes Chandan Brahma, minister of state for Power Topon Kumar Gogoi, MLAs Vinod Hazarika and Rituporno Baruah, top officials, advisres to the CM, representatives of All Assam Matak Yuba-Chatra Sanmilan, All Assam Matak Sanmilan, All Assam Matak Women Council, All Assam Matak Yuba-Chatra Parishad, All Assam Matak Students’ Association were present during the meeting.